Ah, April at last! And while a year ago today, we already had an opening day win to savor, we now have 4 more days to wait for this year’s first regular season game. The current No. 4, however, certainly provides us with much to talk about, doesn’t he? Then again, what is there to say about Yadier Molina that hasn’t been written here before? 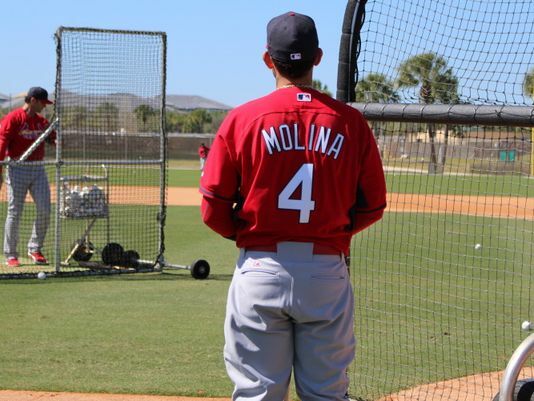 There’s been a love letter, there have been not just one, but two “Molina Monday” posts, he was our BAMF for the 2012 season (and, though unwritten, for 2013 and 2014 — and probably 2015 too), click the link in the first paragraph to read about his heroics last March 31 against the Reds … he’s likely the most written about Cardinal in AMF’s four-plus year history. And why not? 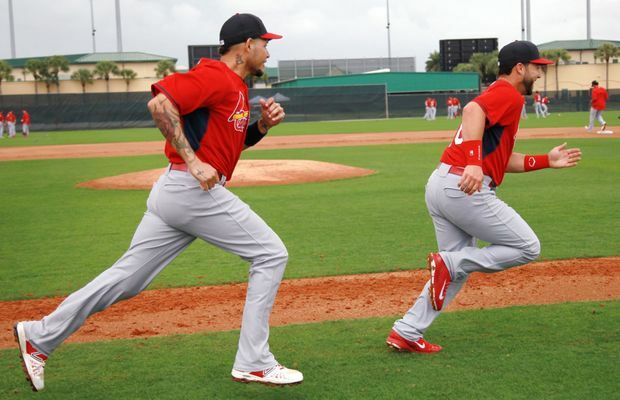 Yadi is the heart and soul of the Cardinals team, taking charge when he’s on the field and, just as likely, when he’s at the plate. What Cardinal fan doesn’t love him? We’ve watched him in action many times during games, taking that walk to the mound to calm and console a pitcher. 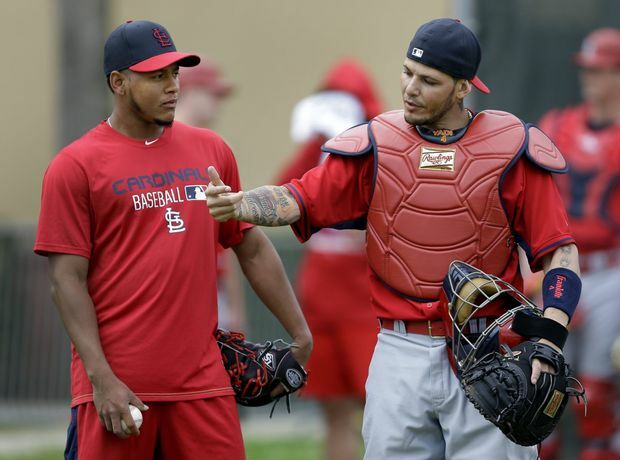 It certainly appears to be a role he takes seriously — even during spring training, as the photo from this spring with now-fifth-starter Carlos Martinez shows. Or at least not Dee Gordon — even going back to 2012, where you can hear a better call from the man Dan McLaughlin was trying to tell a story about in that clip. Yesterday, I mentioned the big homers Albert hit during October. As you may remember, Yadi had one of those too. Before a renovation update was presented to the media on a conference call, Cubs’ spokesman Julian Green launched an offensive against unnamed individuals spreading rumors that the ballpark wouldn’t be ready, the grandstand and upper decks wouldn’t be safe and Major League Baseball was going to force the Cubs to move the opener to U.S. Cellular Field. Green called them “wild and baseless accusations,” adding MLB was not “concerned, mad or disappointed in the team or the pace of construction,” and there were no discussions at all about playing at the Cell. Who gives two hoots about the Cubs! It all about the beer stupid. It’s that 9.00 dollar beer that’s important. The Cubs are just a distraction! Play ball … or just drink your beer, Cubs fans. Regardless, just 4 more days! This entry was posted in 2015 Cardinals and tagged BAMF, Countdown to Opening Day, Yadier Molina by Christine Coleman. Bookmark the permalink.